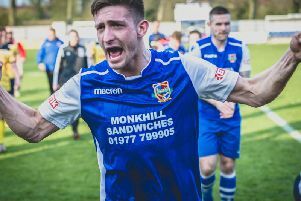 A fantastic first half display saw Pontefract Collieries bounce back in style from their shock defeat the previous week. There was no sign of any hangover from the 7-3 loss at Spalding United as Colls tore into visitors Wisbech Town from the start and were already four up by half-time. Wisbech did manage to avoid a complete thrashing in a more even second half, but the game ended 4-0 to Ponte who held onto third place in the Evo-Stik League’s East Division. The visitors had the ball in the net in the opening minute only for an offside flag to rule the effort out. A minute later it was Pontefract’s turn to be frustrated when the referee deemed the keeper had been fouled as the ball hit the back of the net. Another chance went begging when Colls were awarded a penalty with Connor Smythe brought down, but Eli Hey’s spot kick was superbly saved. Seven minutes later Vaughan Redford headed home superbly, however, to open the scoring. It was soon 2-0 as Nick Guest’s cross led to pinball in the box and Mikey Dunn fired home. Wisbech were struggling to cope now and a brilliant through ball from Redford led to Hey making amends for earlier with a smart finish to make it 3-0. Dunn went close with a half-volley as the hosts remained on top and a fourth goal in 20 minutes followed as Dunn played in Redford who netted his second after taking a couple of assured touches. The second half could not match the first for action with the game effectively all over by the break. Wisbech did get a shot in from 12 yards out, but Ryan Musselwhite saved comfortably, while at the other end several Ponte attacks were snuffed out. They did go close to a fifth goal when Redford was only denied his hat-trick by the crossbar after a chip from the edge of the area. Wisbech missed a late chance, but were well beaten on the day as Collieries rediscovered their touch in impressive fashion to stay ahead of the pack of play-off chasing teams and keep the pressure on the top two. This Saturday Pontefract are at home again when they host seventh-placed Loughborough Dynamo.